That's it for today! Only two tomorrow and then four on Wednesday. Then it should be a schedule of about three a day and four on the last, if I do things right. 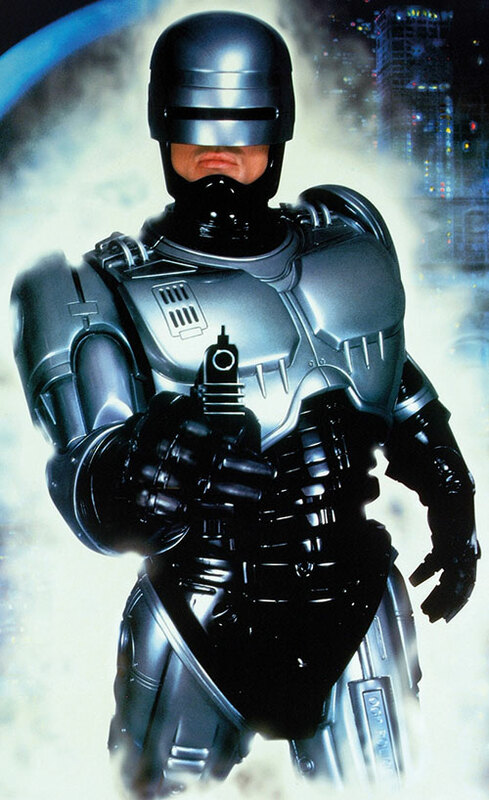 Robocop is a cyborg and the protagonist of the movie series "Robocop" and various spin-offs. Alex Murphy was a police officer in Detroit, which has a police force overwhelmed by crime. Alex was killed in the line of duty but was resurrected as a cyborg with no memory of his past life. He was reborn as Robocop, a police officer created by Omni Consumer Products in an attempt to stretch their monopoly into the police force. Robocop eventually regained his memories and went after the man who killed him, only to learn of a conspiracy within OCP. His discovery lead to Robocop being turned against the police but eventually won the day and appeared in stuff that, let's face it, was never as good as the first Robocop movie. Which is great. Trivia When in full RoboCop costume, Peter Weller would remain in character between takes, only responding to director Paul Verhoeven's instructions when properly addressed as "Robo". Verhoeven found this too funny to take seriously and dropped this after a couple of weeks. Omega Weapon is a robot weapon that appears in a number of Final Fantasy games. Originally appearing in Final Fantasy V, Omega has a round body and spider-like legs. In each game, Omega Weapon is powerful, often able to cast spells as well as a number of technological attacks, including "Wave Cannon", it's signature move. It appears in Final Fantasy XI, along with two variant versions; Proto-Omega and the Pantokrator. Most recently, Omega appears in Final Fantasy XV as a superboss. Trivia As with other recurring powerful bosses, like Shinryu or Gilgamesh, it is hinted that several of the "Omegas" in the series are the same entity across several games, traveling between worlds via the Interdimensional Rift. That's it for today, but I'll make it up to you by having four tomorrow. Do you think it would be ironic if another robot from the Robocop movies ended up in a higher spot on the list than Robocop? Yeah. Woops. I have no clue how I made that mistake. I guess I put Sonny in Hal 9000's spot. Eh. This is like when I went back to the top rock bands list I made in 2008 and found Frank Zappa really high up on my list. I don't even know a Frank Zappa song. How did that happen? I didn't realize Omega Weapon was part of other Final Fantasy games. I just knew him from the epic Chains of Promathia fight in Final Fantasy 11. Fighting that thing, with my friends, at level 60 cap, back in 2006, is one of my best memories. I considered Robocop, but in the 3rd movie someone refers to him as a cyborg, so I kind of thought he didn't count. Well, I know that movie and seriously dislike it. Robo countdown, I am on board! Digging the entries so far. Nice to see more niche stuff like a Final Fantasy boss make the cut, lot of cool designs and creativity there. And FF7 is one of my favs for sure. He is a cyborg. But in the movie they say they only saved his head and one arm (which the businessman says not to keep), so he's barely got any organic parts left. He's mostly robotic. The Borg are an alien race of cyborgs in the Star Trek franchise. Originating somewhere deep in space, the Borg's prime directive is to find other forms of life and turn them into Borg as well. Initially, the crew of the Enterprise encountered them and was only saved by the divine intervention of the god-like alien Q. The Borg eventually found their way into Federation space, tearing through their enemies before the Enterprise crew was able to stop them. Despite this victory the Borg remain feared and one of the few alien races that even many members of the Enterprise crew doubt that can be dealt with in any way other than battle. The Borg's strength comes from their have mind and their ability to adapt to seemingly any threat or weapon. Though they are made of individual units, they function as a single entity, though there have been rare cases of Borg regaining a sense of self and even a small number becoming rehabilitated. During the attack on Federation space, Captain Jean-Luc Picard was assimilated, becoming Locutus of Borg, and though he was returned to normal, the trauma has made it difficult for him to see them anything as an enemy that must be destroyed, despite his reputation as a patient, compassionate and wise diplomat. Trivia Writer Maurice Hurley was the first one to come up with the idea of the Borg, but he didn’t picture them as the humanoid cyborgs they would become. Instead, his idea was to have them be an insectoid race. I'm shocked too. Admittedly for me I've not watched much of TNG and wasn't quite sure what the Borg even are.